Abri du Maras (France): Discoveries reveal behaviorally flexible Neanderthals. How "smart" were the Neanderthals, really? The question has been at the center of scholarly debate for decades. But the findings of recent research, including archaeological investigations at a site known as Abri du Maras, near ArdÃ¨che, southeastern France, have yielded clues that may expand the known repertoir of tools and behaviors that Neanderthals used to survive in the world that existed about 74,000 years ago. An international team of scientists from France, the U.S. and Spain recently conducted residue analysis and zooarchaeological analysis on stone tools and other materials, including otherwise perishable materials such as wood fragments, recovered from excavations at the archaeological site of Abri du Maras in France's Middle RhÃ´ne Valley. What they found was enlightening. "Neanderthal behavior is often described in one of two contradictory ways: 1) Neanderthals were behaviorally inflexible and specialized in large game hunting or 2) Neanderthals exhibited a wide range of behaviors and exploited a wide range of resources including plants and small, fast game," state the authors in a publicly available abstract of a study soon to be published in Quaternary Science Reviews. But the results of their research show that Neanderthals actually "exploited a wide range of resources including large mammals, fish, ducks, raptors, rabbits, mushrooms, plants, and wood. "* The finds included such evidence as cut marks on bones of the European rabbit, rabbit hair residue, plant fragments and fibers, fragments of bird feathers and fish scales, and a variety of projectile points and Levalloise flakes. Levalloise flakes are usually associated with Neanderthal stone tool technology. 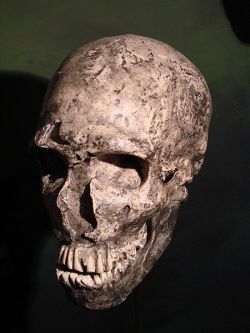 It flies in the face of the popular image of Neanderthals as a human species with a relatively limited set of tools, techniques and resources, a suggestion often cited by many scholars as one reason why they could not effectively compete with the new arrivals on the Eurasian scene, Homo sapiens, or modern humans, leading to the eventual extinction of the Neanderthals. The evidence also included traces of twisted fiber, suggesting the manufacture of cordage or string, and six lithic points that show characteristics implying the use of complex projectile technology, a development that has been usually associated with early modern humans. * Abstract, Bruce L. Hardy, et al., Impossible Neanderthals? Making String, throwing projectiles and catching small game during Marine Isotope Stage 4 (Abri du Maras, France), Quaternary Science Reviews, Vol. 82, 15 December 2013.